Is it going to be a scaled down version? Ah Scalebound. Remember Scalebound? The dragon-themed RPG that was in development as an Xbox One exclusive by Platinum Games might be making a comeback according to a new report, specifically as a Nintendo Switch title. The latest gossip comes via NintendoInsider, which claims that Scalebound is coming back. "I have confidence in my sources to report that it is my understanding that Scalebound has been resurrected as a project to be released as a Nintendo Switch exclusive," reads the report. Interestingly, earlier this month, Game Informer hinted on Kinda Funny Games about a “game that’s thought to be dead that Nintendo’s reviving”. Apparently, Scalebound is said title. That would come as quite the happy news, as when it was announced that Scalebound was going the way of the other giant, scaly things, back in 2017, the fanbase was incredibly distraught. "After careful deliberation, Microsoft Studios has come to the decision to end production for Scalebound," a representative wrote at the time. "We're working hard to deliver an amazing lineup of games to our fans this year, including Halo Wars 2, Crackdown 3, State of Decay 2, Sea of Thieves and other great experiences." 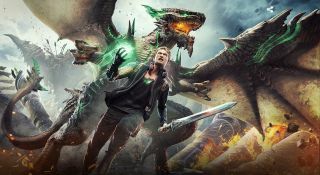 Microsoft cited "business decisions" as the reason for Scalebound's cancellation, but of course, that doesn't always come as the best news for those waiting for some epic dragon-commanding action. Interestingly, this isn't the first time Nintendo has dived in to save a Platinum Games title from extinction. Bayonetta 2, originally in development under Sega, was left half-finished and with no-one to fund it until Nintendo came along and agreed to publish it and release it on the Wii U. It wouldn't come as too much of a shock then to see Nintendo do the same again with Scalebound and make it a Nintendo Switch exclusive, alongside the upcoming Bayonetta 3. Of course, until it's officially announced by Nintendo or Platinum Games, take a report like this with a pinch of salt, but I for one would be incredibly excited to see it return.